And we’re up and running! 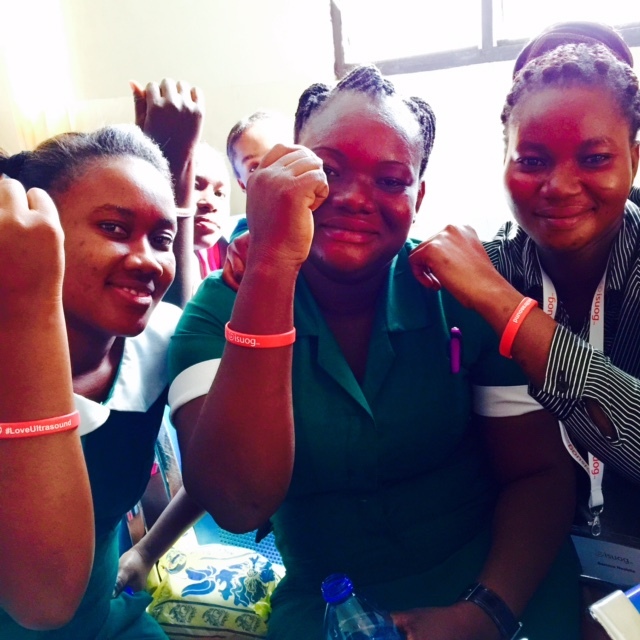 ISUOG kicked off the first part of Phase II of our Outreach program in Kumasi, Ghana. The day started strong with Project Leader and Outreach Committee Chair Anthony Johnson (USA) introducing the Outreach Volunteers to the 25 trainees at Kumasi South Hospital. This time round, 15 of the trainees were basic with no previous ultrasound experience while 10 were advanced, having previously participated in the last program. If there was a key word for the program this time, it would be empowerment. Two of our strongest trainees from our last trip – Yusif Yacub and Buah Hamilton – are joining the ISUOG team and are teaching the trainees themselves, tackling topics such as ectopic pregnancy and second trimester scanning. It must be said, Yusif stole the show with his charismatic presentation skills and stories from the scanning room. GE Healthcare’s Tammy Anderson explained to the group how to use the new machines – three brand new beautiful voluson ultrasound machines – which was the cause of much excitement once the group to the chance to scan during the first live scan session, led by Tammy and Janet Horenstein (USA). It was a really special moment too as one of the patients being scanned had not had an ultrasound until that day and was overjoyed by the image of her unborn son. Theodora Pepera-Hibbert (Ghana/UK) focused her talks on using ultrasound for Gynecology cases and, despite the projector breaking down half way through during her presentation, her passion for scanning radiated in her engagement with the group and helpful insight on proper scanning practices, such as speaking to the patient and communicating with her about the procedure. Day one was rewarding and jam packed, but only a taster of how the rest of the week will be – stay tuned! Previous On the road again – we’re returning to Ghana! Next ISUOG Outreach in Ghana: Kicking off day two!